It's been a while since Moth and myself made a birding foray together. Various commitments of one sort or another, for both of us, conspired to prevent a joint day out birding but this Friday we finally managed to co ordinate our diaries. I was not sure where we should go as there had been the tempting prospect of the long staying Stilt Sandpiper and Long billed Dowitcher at the RSPB reserve at Frampton in Lincolsnhire but then in East Sussex a Semi palmated Sandpiper was found at The Cuckmere and a Barred Warbler was at nearby Newhaven. However this dilemna was dispelled when all the aforementioned birds disappeared by Thursday. I had though, seen alluring photos of a Pomarine Skua on my Twitter feed at the beginning of the week, that indicated that it was showing really well at a place called South Gare, near Redcar in far off Cleveland but it was a long way to go on the chance of seeing it, although, by all reports the skua was fairly reliable in its appearances, hanging around on a nearby beach or the local breakwater at the mouth of the River Tees. Still uncertain about the skua, our destination was decided once and for all when sensational pictures of a Wryneck at the RSPB reserve at Bempton Cliffs just fifty miles south of South Gare, started to appear on social media on Wednesday night. The Wryneck was a particularly confiding individual and was being watched from as close as just a few feet without showing any alarm whatsoever. This was too good to pass up and to see a Wryneck and a Pomarine Skua in one day would mean a great double birding triumph if we could pull it off. An added incentive was that Moth had only ever had fleeting views of a Wryneck and had never seen a Pomarine Skua. As per our usual arrangement I collected Moth from his home in Eynsham at 6.30am on a pleasant, sunny, Friday morning and crossing the county on rural roads, to avoid the usual Oxford traffic bottlenecks, we joined the headlong M40 motorway traffic and commenced a four hour drive, north to Bempton. Moth regularly checked my RBA app but there was no news about either the Wryneck or the Pomarine Skua and I felt the first signs of that slightly queasy and anxious feeling in the pit of my stomach. 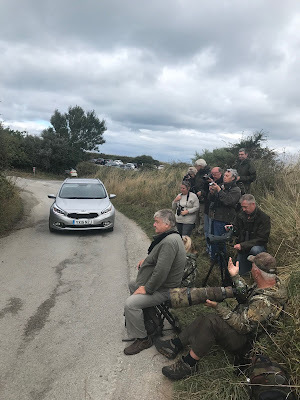 This got progressively worse as time passed by and still there was no news on the Wryneck, in particular, but we consoled ourselves by telling each other that the time was still early, it was only 8am, Wrynecks can be elusive anyway and the RSPB usually do not stir themselves before 9am. Anything could happen and we would have to be patient. The time passed pleasantly enough, apart from the onset of my mild anxiety, as the miles receded and we chatted the time away, finally crossing into Yorkshire. Moth checked RBA again and at last there was news of the Wryneck. It was still at Bempton as of 1030 this morning.We had another hour to go before we reached Bempton. The steely grey outline of the North Sea came into sight, away on our right, but now clouds had begun to obscure the sunshine and a strong wind was blowing from the northwest, causing grey clouds to scud across the wide skies as we continued heading north and commenced ascending, climbing ever upwards towards Bempton. Soon we were entering the surrounds of the RSPB's reserve at Bempton, which is perched high on the cliffs but we were not going to that part of the reserve today but to a secluded little area called The Dell, which is near the Visitor Centre and is surrounded by a narrow, one way, circular road allowing access into and out of the reserve car park. The Dell itself is an overgrown area of nettles and bramble bordered by a hedge running between it and the circular road. We parked the car and got all our birding gear together, which seems ever more burdensome these days. Rashly I had decided, in the pleasant sunshine of Oxfordshire, to wear shorts but here in North Yorkshire the sky was grey and sunless and the wind was cold, as it whipped around my bare legs. With no long trousers in the car there was nothing for it but to don the only other option, my waterproof trousers which are always in the car's boot, just in case, and these did the trick admirably. And it was just as well as a few drops of rain fell from a passing grey cloud but then, thankfully,ceased. I had no idea where The Dell was so we enquired at the Visitor Centre and were told it was just the other side of the car park and we had in fact driven down past The Dell on the entrance part of the one way road. The Wryneck was to be found by the exit road on the other side of The Dell, just beyond the car park, literally a couple of hundred metres away from us. 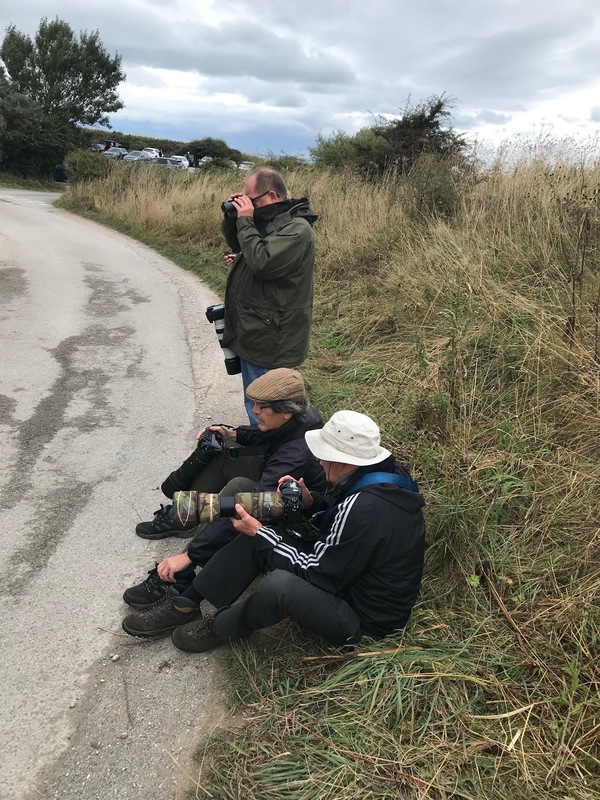 'You will see the birders stood by the side of the road. You cannot miss them' we were advised by an RSPB volunteer in the Visitor Centre. 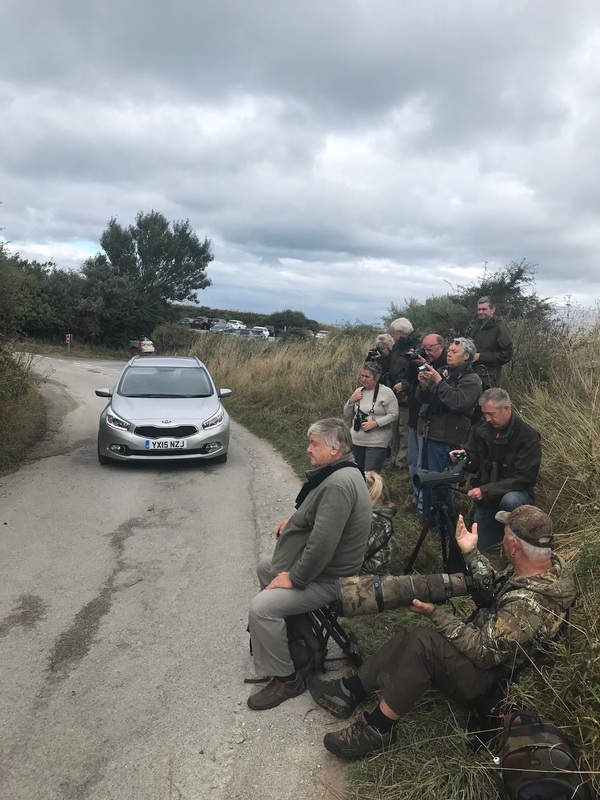 He was not wrong but there was no big crowd just three birders stood or sat by the roadside pointing bins and cameras at a grassy and dry earthen bank below a thick thorn hedge immediately on the other side of the narrow exit road, that was just wide enough to accommodate a single car, hence it being one way. Our fellow birders were all concentrating hard on a particular spot so it was obvious the Wryneck was in view. We joined them and just three metres away, maybe less, on the other side of the road at the bottom of the bank was the Wryneck, scuttling and scuffing about in the profusion of dead grass and weeds hanging over and down an earth bank, baked by the summer drought into a cracked solidity of parched pale brown. The Wryneck was industriously searching for ant's, insinuating itself through the long grass, pushing and thrusting and contorting itself and hanging onto the side of the bank with its feet, its long thread thin sticky tongue flicking in and out of its bill to catch the ants. If it could not find any exposed ants it would vigorously dig at the dry earth with its pointed bill in order to expose them. Wrynecks are a member of the woodpecker family and are similar to a Green Woodpecker in their feeding habits, in that a Green Woodpecker also has an adapted long thin tongue and likes nothing better than to find an ant's nest in a grass field or lawn on which to feed on the unfortunate occupants. Wrynecks, unlike any of the other British woodpecker species, do not cling vertically to trees and do not possess the short, stiff tail feathers that woodpeckers use to prop themselves up against a tree trunk but have longish soft feathered tails, so perch crosswise like a normal passerine bird would do, although their feet betray their woodpecker origins in that the feet are zygodactyl, that is two toes are positioned forwards and two toes are positioned backwards. Their name comes from the fact they can twist their necks for almost 180 degrees and they use their flexible necks in nuptial display and also as a defence mechanism. I can recall catching one, when bird ringing many years ago, and it slowly rotated its neck and twisted it sinuously whilst hissing, to imitate a reptile, in the hope the shock would cause me to let it go. In past times this behaviour ensured they were very much associated with witchcraft and the first part of its Latin name Jynx torquilla gives rise to the popular phrase 'to put a jynx on someone' or 'to be jynxed'. Wrynecks formerly bred in Britain but are now only seen on migration, chiefly in autumn, such as this individual at Bempton and this week there have been many reports of Wrynecks from various parts of Britain as they head southwards. Their breeding range includes all of Europe right across, in the form of various sub species, to the Pacific Coast of Asia. All the populations are migratory and European birds winter in tropical Africa and Asian birds in southern parts of Asia. It is estimated that the world population is around fifteen million individuals and currently is considered to be under no immediate threat. Looking at this bird at Bempton, from no more than just a few feet away I could but marvel at its cryptic plumage, an intricate patterning of upper part greys and buffs, barred and mottled in various shades of pale brown, with rufous and black bars and wider black and dark brown streaks. 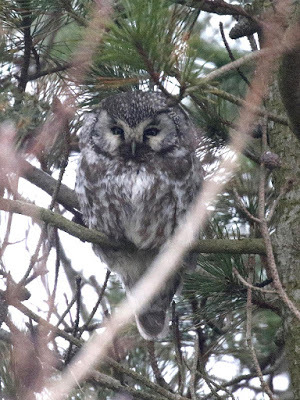 Its rounded tail was grey, speckled brown and faintly and narrowly barred with brownish black while its chin and throat were buff yellow with thin brown bars. 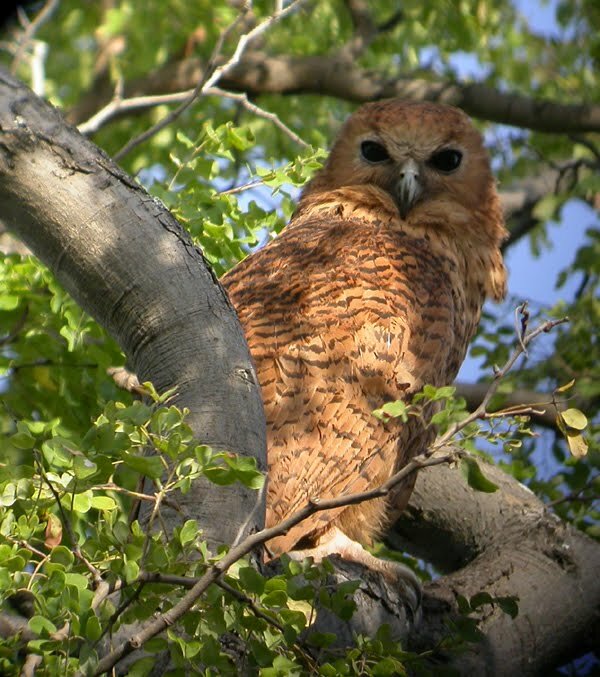 The rest of its underparts were creamy white, again liberally spotted and barred with darker markings. I noted how this plumage made it almost invisible in the dead grass especially when it remained motionless for periods. Although Wrynecks have disappeared from Britain as a breeding bird it is not uncommon here on migration but its elusive nature whilst superbly camouflaged by its plumage and its preference for feeding on the ground in dense cover makes it often hard to find, let alone see well and therefore it is much sought after, especially when it is as confiding as this bird at Bempton. I watched this Wryneck with continuing delight, as to be so close and to have it on view for so long was an almost unique experience.For the majority of the time it was in the thick of the grass on the bank, burrowing through the grass stems and hacking at the earth but on a couple of occasions it came right down onto the edge of the road and into the open and here was the chance to get a photo of it, unencumbered by annoying grass blades and stems. Vehicles leaving the reserve car park regularly came up the road but all of them on seeing us ranged along the side of the road courteously stopped and waited until we waved them on. One of those large square mobile home vehicles that seem to have replaced caravans came up the narrow road and in its attempt to avoid us on one side of the road narrowly missed squashing the Wryneck on the other side but all was well and after it passed we found the Wryneck had not even moved. It was so totally fearless of anything or anyone I worried for its long term prospects as surely it would be more than usually vulnerable and susceptible to mishap of one sort or another. Eventually it flew up into the depths of the hedge and disappeared but fifteen minutes later it was back, perching for a while in the hedge before descending down onto its favoured bank to start seeking out more ants. The sun came out and its plumage of subtle colours and complicated patterning looked even more magnificent and delightful. It stopped feeding and sat half hidden in the grass and opened its bill. I could only presume it was sun bathing and thermo-regulating by opening its bill to cool itself. At that moment you could easily relate to its reptilian ancestry and it did not look quite so beautiful but then the sun went in, it closed its bill, recommenced feeding and became once more an object of birding desire. I turned to Moth. 'Pom Skua time'? 'Yeah, let's go' he replied. Moth was keen to see the skua and I spoke to a local birder who I had overheard talking about the Pom and where to find it. He gave me detailed directions which was just as well as the postcode RBA had given for the location was generic and not specific. Armed with this information we returned to the car, not without an element of triumphalism in our demeanour I should say, and duly headed for South Gare, another fifty miles north and which lies just beyond Redcar, on the southern side of the mouth of the River Tees . The weather was taking a turn for the worse with the clouds becoming darker grey and threatening and it was not too soon before the first heavy rain shower hit the car's windscreen but we could see that further beyond there was clear sky, so maybe it would be just the occasional heavy rain shower and there would be opportunities between the showers to see the Pom Skua. If not and the showers became steady rain it would not be pleasant, as the skua was to be found on a wide exposed beach and there would be no shelter from the rain or the strong northwest wind which, combined, would make for exceedingly uncomfortable viewing. 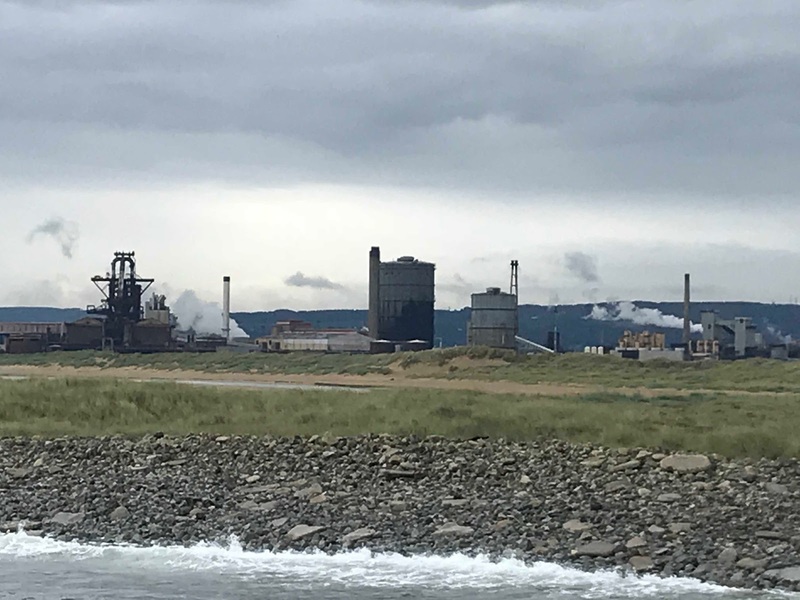 Anyway that was for when we got to South Gare but for now we had to drive the fifty miles between Bempton and South Gare. We passed through a busy Scarborough town centre and then out along less crowded roads with the North Yorkshire Moors on our left, headed towards Redcar. Regular rain squalls hit us, heavy at times but they always cleared to leave a dry interval afterwards. 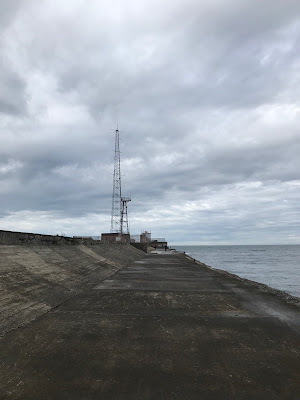 Using a combination of an old fashioned road map, the Satnav and Google Maps on my phone plus the directions given us by the birder back at Bempton, we found ourselves turning into an industrial area that had clearly seen better days. 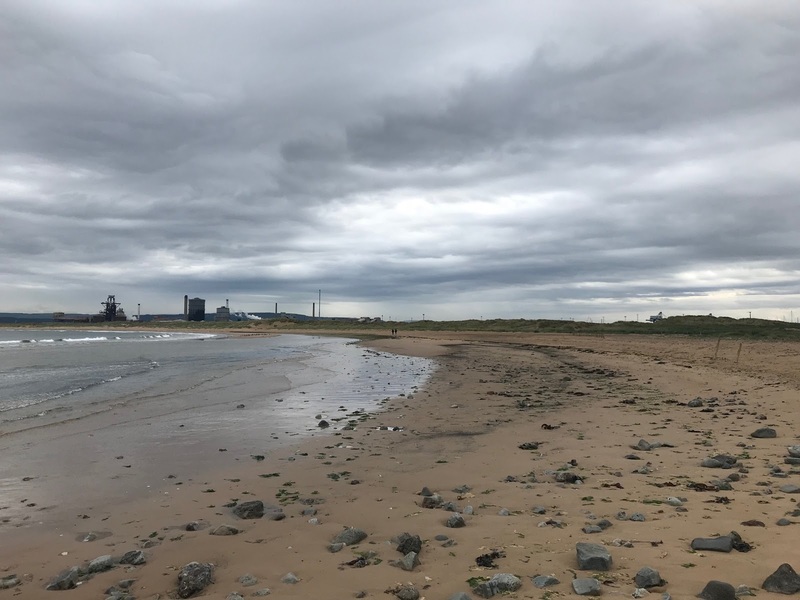 This was South Gare, which is an area of land and breakwater reclaimed between 1866-1888 and jutting 2.5 miles out to sea forming the southern side of the mouth of the River Tees. We followed an uncertain, failing road past industrial units and then crossed a defunct railway line, ignoring notices stating it was private land from now on and entry was banned. We had been told to ignore these notices as they no longer applied, but did some years ago to protect the huge and now completely derelict steel works on our left which was rusting into oblivion, having been abandoned as uneconomic two years ago with the loss of 3000 jobs, despite the Chinese Government pouring millions of pounds into it in a failed effort to keep it viable. Is there anything more depressing than such a sight of so obvious complete and massive failure? No attempt at tidying the landscape has been made and it is just a sad monument to the failure of economics, futile human ambition and folly.The massive rusting structures of the steel works towered over the landscape, dominating in an awful majesty as we passed them with a shudder and continued out along the road onto a windswept finger of litter strewn land, on which the abandoned leatherette sofa was a nice touch, and that led to a long and massive concrete breakwater guarded by hostile railings and with a lighthouse at its very tip in the process of renovation. The beach, a wide sweep of golden wet sand was on our right beyond an area of dunes. It was that kind of landscape, where the unattractive dereliction, despoilation and sense of abandonment conflicted with the dunes and beach struggling to maintain their natural beauty, an all too depressing manifestation of human indifference to the environment as nature slowly tries to reclaim this small forsaken part of the coastline, besmirched by litter and dross from an uncaring populace. We had little information as to where exactly we needed to look for the skua and hoped there would be other birders around but we could find no one to ask. We drove almost to the end of the road and found two elderly birders standing by their car with a scope and looking out to the distant beach. Surely they would know? We stopped and made enquiries but they knew just as little as us.They told us the skua had been showing really well on the beach at lunchtime according to a friend of theirs. One of them then called the friend who confirmed the skua was usually to be found either on the beach or out on the breakwater near to the lighthouse where the fishermen, standing precariously on the end of the massive concrete breakwater occasionally fed it fish scraps! Gary, one of the elderly birders, had severe mobility problems and could not possibly walk as far as the beach or to the end of the breakwater where the lighthouse was, so I took his phone number and said we would go to the beach to investigate and if we found the skua would call him.He could scope it from the road if it was there as we could point out where it was on the beach. I was not optimistic as there was a windsurfer on the beach and it looked bird free apart from a large roosting flock of Oystercatchers further along the beach. However part of the beach was obscured from the road by the intervening dunes, so we had to check just in case. It was just as well we did as on getting through the dunes to the beach there was the Pomarine Skua, stood resolutely on the sand, entirely alone and its position was so high up the beach and behind the intervening dunes it meant it was invisible from the road. It was a superb adult in full summer plumage although its wings were beginning to show signs of wear and tear and the central tail feathers had lost their twisted tips but apart from that, it was in its full breeding splendour. Black cap, a strong yellowish suffusion around the sides of its neck, very dark brown almost black upper parts and white underparts, a broad diffuse breast band of speckled grey smudging and upper flanks similarly barred and smudged with grey brown. It was all here on full view on this Pomarine Skua. A magnificent sight, its demeanour assertive and one of no nonsense. Pomarine Skuas are migrants that are circumpolar Arctic breeders migrating south to spend their winter in tropical oceans. Birds that pass Britain move southwards between mid August and October to winter off the African coast usually north of the Equator. The main concentrations of wintering birds being where there are oceanic upwellings between Senegal and the Gulf of Guinea although some birds are known to migrate as far as the coasts of Namibia and South Africa. It is unusual for them to stop, like this one, for an extended period of time during their autumn migration but occasionally it does happen and I can recall an adult on the River Severn many years ago that spent some days feeding from a dead cow and another, a juvenile this time, that spent some days feeding on a dead goose on the coast of Lancashire. I called Gary and alerted him to the presence of the skua and where it was. He and his colleague commenced walking back down the road to get an angle of view that would allow them to see the skua on the part of the beach I had indicated. We approached the Pom Skua and it stood its ground but looked a little anxious at our presence. It allowed us to get reasonably close before flying further off along the beach. We followed and got more pictures but then it flew again and headed up and off towards the lighthouse and we lost it from view. We wandered out to a rocky point at the seaward end of the beach and I found a flock of mainly Arctic Terns and a few Sandwich Terns roosting here but could not get close to them and without a scope could not identify the two or three Roseate Terns I knew, from previous reports, were in amongst them. 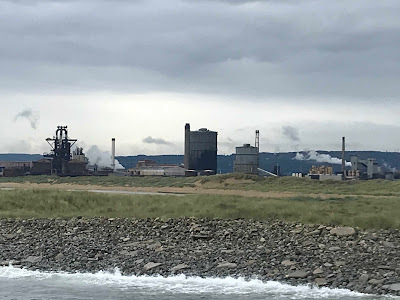 I called Gary again and was amazed to learn he had not managed to see the skua.We returned to the road and to cut a long story short, in our search for the skua looked along the nearside of the river mouth and across to the huge chemical works on the other side. Here it was very windy and I watched a ship making its way out to sea. There was no sign of the skua, just Cormorants, gulls and a lone Guillemot bouncing up and down on the wind tossed waves. It was decidedly unpleasant here, grey, overcast and windy with rain in the wind. We returned to the car and I suggested to Moth that we might try walking out to the end of the breakwater and the lighthouse. We passed through a gap in the railings and walked towards the lighthouse. It flew again but obviously wanted to hang around and returned to settle on the breakwater once more. We got quite close to it again and got better photos. This went on for some time with the skua alternately remaining on the concrete breakwater or flying out to settle nearby on the sea. Gary and his friend departed and we were on our own with just one other birder.The Pom then flew off to the beach but eventually returned, landing further out towards the end of the breakwater and we eventually joined the other birder to watch it. It was a little wild and bleak out there but the Pomarine Skua seemed to like it and after a spell on the sea, bathing vigorously, it flew back in towards us, coming closer and closer and yet closer to land just a few metres in front of us. Brilliant, and it stood here for some time before flying off again but returning once more to settle on the sea close in to the breakwater. A strange, two note gull like call had me mystified for a while until I realised it was coming from the Pomarine Skua. It was calling as it was annoyed with a persistently attentive juvenile Herring Gull. This was a first for me, having never heard a Pomarine Skua make any sound before. We watched the skua for another half an hour as it mugged the juvenile Herring Gull of its fish and then hung around near to a fishermen hoping to get some fish scraps. During one of its absences from the breakwater an adult Kittiwake came to perch on the breakwater, also landing very near to us and then to complete our day, three plump waders landed on a slipway, the green weed on the concrete slowly being exposed by the receding tide. They were Purple Sandpipers and we decided that this should be a fitting end to a memorable day of birding, as currently there was no sign of the Pomarine Skua returning.